Severe weather across Berkshire has caused widespread problems, including flooding of roads, houses and shops, and the closure of several schools. Children from Aldermaston Church of England Primary School were evacuated by boat after they became trapped in the school by rising flood waters. The floods have forced four schools in Maidenhead to close and homes have been evacuated in parts of the town. There are also traffic problems after a landslip on the nearby M4 motorway. Furze Platt Infants School and Boyne Hill Infants School in Maidenhead, along with Trinity St Stephen's School and Windsor Boys School in Windsor are closed. The Emmbrook School in Wokingham was also shut. Nicholson Walk shopping complex in the town centre also had to shut its doors to customers because of rising water. 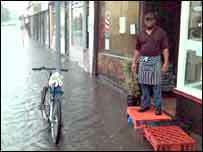 Newbury has also been badly affected by flooding. In Reading, Christ the King Primary School and Micklands Primary School were forced to close early and the Museum of Reading has been closed "for the safety of visitors and collections", according to the borough council. The fire service is asking householders who are flooded to only dial 999 if they are in danger or if the water is more than 6in (15cm) deep, otherwise they should call the borough council. Additional staff have been recalled in to the fire service control room to deal with the volume of calls. The Royal Borough of Windsor and Maidenhead Council, which is now handing out sandbags, has set up an emergency centre to co-ordinate its response to the adverse weather conditions.